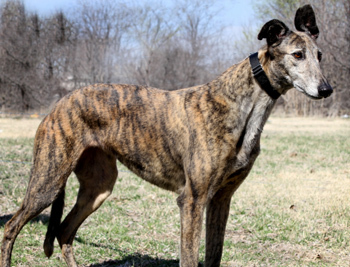 Kim, aka AZ Beauty, is an almost 9-year-old brindle female born May 16, 2002. Her sire is the famous and talented late Gable Dodge and her dam is Solitary Glass. 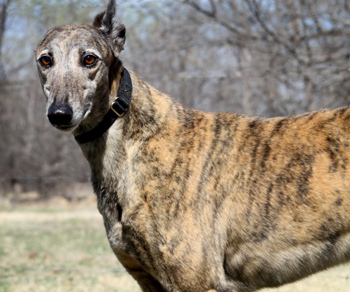 Kim has just 5 races to her credit on greyhound-data.com, all at the Ebro track in Florida in January and February of 2004. 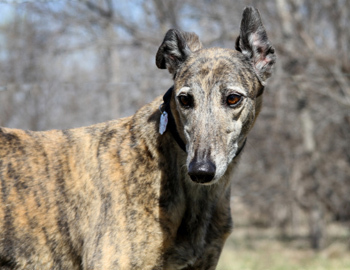 As you can see, Kim has some talented ears, and she's ready to jump straight into your heart! She has not yet been tested with cats or small animals.